Twitter subjected to Quality Filter Discrimination (QFD shadowban) not only expected targets, such as @cernovich, but also Trump Republicans, a walking away liberal Brandon Straka (@usminority), and even Adam Carter (@with_integrity). Adam Carter is one of the leading researchers who refuted Hillary’s conspiracy theory that Russia had been behind the leaks of the 2016 election campaign. This conspiracy theory has been built on false claims by CrowdStrike, in which Google is a major investor. The QFD shadowbans were observed on Twitter from July 23 to 24. Twitter has apparently lifted the shadowban after a public uproar, but it maintains a list of the targets from which Republican congressmen had been removed. Twitter also stopped delivering my promoted tweet in support of #WalkAway after the first tens or hundreds of views, although the tweet had been scheduled to get thousands of views a day and to run for many days. In its typical fashion, Twitter failed to even notify me of its decision. 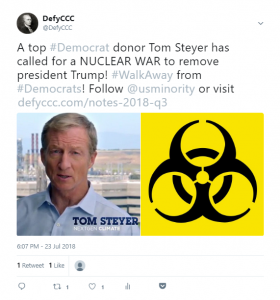 This is another type of shadow ban. (Posted on 2018-07-20) Contrary to their false statements before congress, Google and Facebook continue censoring conservative speech. At the time of the explosive growth of the #WalkAway movement (liberals leaving the Democrat Party), Facebook stopped and put in review my sponsored post, supporting Brandon Straka and #WalkAway. The post had already been approved and was delivering. Facebook was keeping the post in review for more than two days until I disabled it. 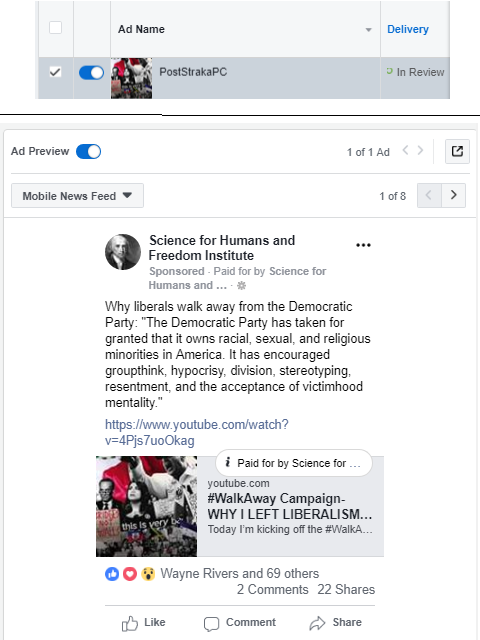 Note that Facebook had previously vetted my page for the Science for Humans and Freedom Institute, assuring that it’s run by an American citizen and resident, and qualified it for what it defines as political ads. Google suspended my AdWords account earlier this year following a New York Times article calling me by name and demanding Google to remove links to “climate deniers.” A few weeks ago Google refused to re-instate my account. I guess my experience is not an exception, and that Facebook, Google, and Twitter regularly take actions to stop or to slow down pro-Republican and pro-Trump grassroots movements. The self-appointed Masters of the Universe also abuse their power to boost every anti-Trump hysteria. Should it surprise anyone the main stream media is a major ptppaganda tool of the left. All the main stream media ever has been in every country of the world that ever existed, has been a means by which that government can influence, sway, control and manipulate the people without using force. America is no different. If you think you are getting the truth from Hollywood, the 6 o’clock news or the internet, you’re fooling yourself. Don’t be lazy. Do your own research. With diligence, you will discover the truth for yourself… like the ‘Big Lie’ that is global warming.